When my son was transitioning from formula to cows milk he experienced really bad constipation. I looked all over the internet for the cause and many moms reported that cows milk had caused similar symptoms to their babies/toddlers. Most of them found that switching to almond milk solved the problem. I began giving him vanilla almond milk to drink and immediately the constipation was gone. He was a different and much happier one year old. Recently, I’ve been asking my friends to take a similar challenge if they haven’t tried Silk Vanilla Almond milk before. I was surprised that everyone I approached had already tried it and the vast majority really enjoy it. I even learned a lot about almond milk by talking to my friends. One of my friends is a health buff and says her family regularly drinks Silk Vanilla Unsweetened Almondmilk because it has twice the calcium as cows milk, less than half of the calories as skim cows milk, and a fourth less calories than whole milk. It also has lots of healthy vitamins and nutrients in it. Another friend of mine uses it because Silk Almondmilk is one of the only kinds that does not have GMO ingredients and carrageenan in it, which she tries to avoid. I asked my sister to taste it and she told me drinks it everyday because she is a little lactose intolerant and she digests it better and loves the way it tastes. A neighbor swears that Silk Vanilla Almondmilk makes awesome frosting! Using it for frosting is something I had never even thought to try before. She also said it can be used to thicken soups and as a substitute for cows milk in most recipes. Another friend of mine loves to make smoothies with it every morning. She also has been purchasing Silk Vanilla Almondmilk regularly after her daughter recovered from the flu. After her illness was gone they found that she could no longer tolerate cows milk (something her doctor says does happen to people on occasion). So her daughter now drinks it all the time. 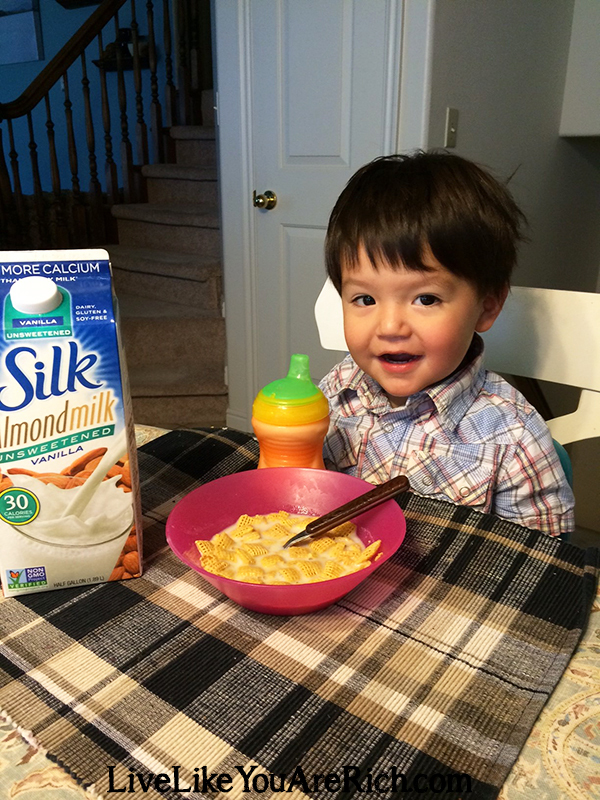 Almondmilk really is very well liked by a variety of babies/toddlers, children, teens, and adults. I remember recently watching an episode on Dr. Oz about alternative milk choices to cows milk. They asked a bunch of different aged people to come up on the stage and drink multiple different types of milk (without telling them which was which) and asked them which they preferred. Almost everyone said they loved the almondmilk the best! So I along with Silk Almondmilk invite those of you who haven’t tried this delicious type of milk to take the challenge and give it a try it! They also have a Silk Chocolate Almondmilk that is delish! 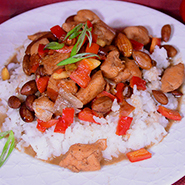 It’s healthy, low in calories, delicious, and is really great for those with lactose intolerance as well. I am so glad i read this! I am taking my 3 year old off of cow’s milk now. He has such bad constipation. I hope this will help him. Thanks so much for writing this! You’re welcome Amy! I hope it helped! Thanks for sharing. Never knew too much about Almond Milk. Did not know it was GMO free. I will have to try it. I like the fact that it possibly banished constipation as opposed to cows milk. 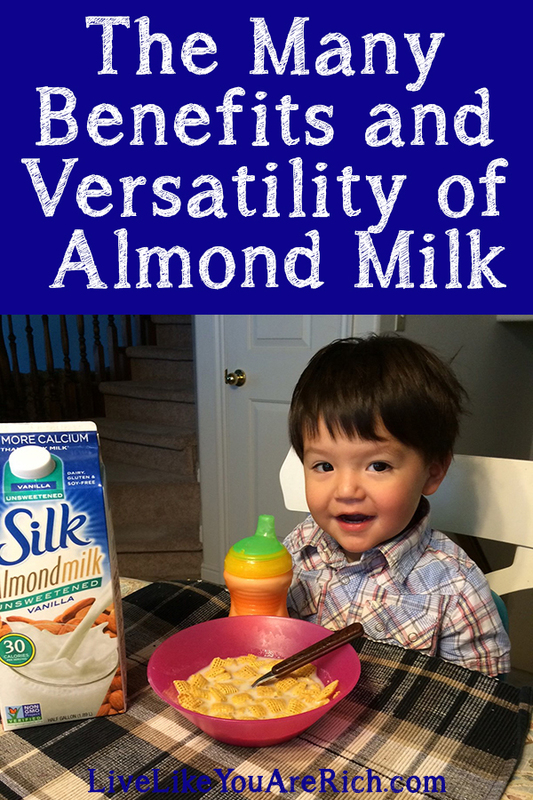 It worked great for my son while he had that issue, he can now drink cow milk and almond milk without problem! Thank you for your comment.